Getting into something like K-ON! is a lot like developing a drug habit. All it takes is one fateful bout of curiosity and then a few years later, you find all your savings poured into collecting 1/8th scale figures and importing limited edition Blu-rays. People on the outside won’t really understand why you’re into it. Users will defend their vice claiming that there is no harm done and the whole point is merely to feel good. For a while, you can successfully keep your tendencies under control. At some point, you reach a turning point when you can no longer convince anyone, not even yourself, that you’re on the right track. So, you grow out of it, seek help, move on, look back on the experiences fondly, and shoulder any regret, or you indulge deeper, lose sight of reality, and plummet into the abyss, chasing after a fleeting moment of euphoria. I feel like I’ve let the prose get ahead of me for a manga review about a quintet of schoolgirls, all members of their school’s Light Music Club, doing silly things and being cute. Even so, I can’t deny the unsettling parallels between drug usage and reveling in the moé lifestyle. It can’t be ignored that there are some deeper machinations at work to have propelled this humble 4-koma gag manga into a merchandising empire that will keep a few creators and publishers financially sound for a time. It’s easy to forget there ever was a manga while the anime has commanded such a blinding presence in the last couple of years (primarily in Japan, different story in the West), and I would argue the franchise wouldn’t be half as successful had Kyoto Animation (KyoAni) not been handed the reigns. K-ON! is one of those cases where the adaptation overshadows the source material. I would like to stop talking about what KyoAni has done for K-ON! and focus on the manga in question, but it must be said that Kakifly provided an excellent framework rather than a fully realized work. If your first taste of K-ON! came from the television show, the manga may come across as a downgrade. Most of the essential elements are there, but there’s something missing. We might as well get it out of the way now and admit that the missing piece is that deft, loving KyoAni touch that elevates erog and light novels to heights unimaginable by their original creators. While Kakifly competently illustrates the experiences of a group of high school friends, KyoAni breaths life into the world and quite literally makes the characters come alive and sing. As unremarkable as I make it sound, Kakifly’s K-ON! is still one of the better slice-of-life manga out there. Like any good slice-of-life 4-koma, it’s easy to pick up and effortlessly flip through a whole volume in an hour. There are no ponderous subjects to tackle, hardly any moments of distress, and most conflicts are resolved through spirited enthusiasm and encouragement. Kakifly plays up the sexuality plenty of times, either for a joke or a splash page, but don’t get the wrong idea that K-ON! is some sort of subversive perversion of schoolgirl idolatry (the author isn’t nearly brilliant enough to make that work). Between the anime and the manga, Kakifly takes the crown for having the sexiest content of the two, but even he manages to show some restraint. There are no two-page full color spreads of bathhouse scenes with the Light Music Club, although I’m sure you’d be able to find a poster like that by browsing through K-ON! merchandise. I don’t want to make any excuses for K-ON! to explain why I like it so much, which is why I need to admit that several criticisms about it are on the mark. K-ON! is about nothing, aside from an account of a high school music club across three years, and occasionally there are too many bare thighs and maid outfits for the typical manga cynic to stomach. K-ON!’s greatest strength that prevents it from collapsing into a sugary goo are its characters. Granted, this won’t work for everyone, but endearment towards the characters goes a long way in one’s enjoyment of K-ON!. 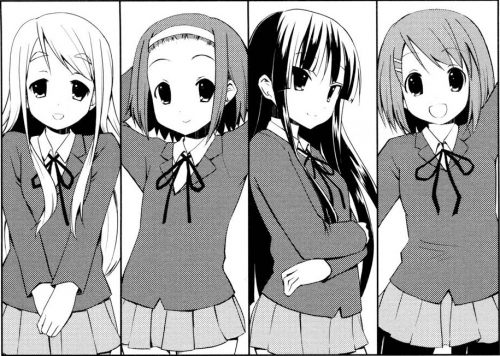 While several characters are pulled from stock anime personalities (Ritsu is the energetic girl! Mugi is the kind-hearted rich girl! Nodoka is class rep among class reps! ), the execution is such that everyone mixes together well. The anime might do it better, but the manga does a fine enough job convincing me that these people can be friends for reasons other than "we're in the same club". Each character possesses distinct minor traits and are allowed equal time to shine, avoiding favoritism in what is supposed to be an ensemble cast. The clean and attractive character designs avoid the usual anime embellishment, opting instead for a subdued and unified design across all characters. They are “real” enough while allowing Kakifly space to capture the characters' expressiveness. For a manga that is wholly character-centric, Kakifly makes it look good by keeping it simple. The situations and jokes are such fluff, readers are likely to either grin like a creepy idiot or frown with measured disappointment. Don’t expect too much in-depth musical territory to be covered in the manga, as the girls spend most of their time lounging around in the club room or hanging out in town and each other’s houses. The leisurely pace of Kakifly’s high school utopia covers the usual circuit of Japanese adolescence, from school festivals to club trips. It’s hard not to get even a little invested in the world and characters when it’s made to be so appealing. 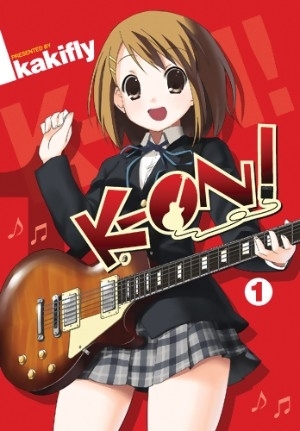 The Yen Press release of K-ON! is put together quite nicely. The pages are larger than the typical manga volume, so you won’t need to keep the book so close to your face to absorb the details. Each volume has an abundance of color pages and a few extras tacked on at the end, which I appreciate. The covers and spine are done up in each featured character’s image color and look appealing when lined up. I have minor grumblings about the localization, a welcome change to how I normally feel about having things I like put in a language I can understand by people paid to do so. I commend Yen Press for not writing out Mugi’s yuri-vision scenes after KyoAni killed that noise early in the anime adaptation. However, they dropped the ball by swapping out the onomatopoeia in Azusa’s nickname for the American equivalent, despite how damn near everyone who would pick up K-ON! knows what “nyaa~” is. Yen Press even goes to the length of including a glossary in each volume to explain details that might be lost on American audiences, yet they couldn’t keep “Azu-nya”. Not to mention how poorly “Azu-meow” tumbles out of my dumb American mouth. I suppose the purpose of a review is to sell someone on a product, but I can’t put it out of my mind the weight one must carry to enjoy something like K-ON!. To the uninitiated, approaching K-ON! requires a blind leap. You either come out of it feeling gross or you discover a new dimension to that Japanese stuff you enjoy so much. If you’re like me, you won’t find out about the dark side of seinen manga target demographics until after you’re in too deep. You’ll most definitely be judged for being into “That Little Girl Crap”, but they can never hope to understand you or your moé. Like with any drug, remember to never take it too hard and always mind your budget.